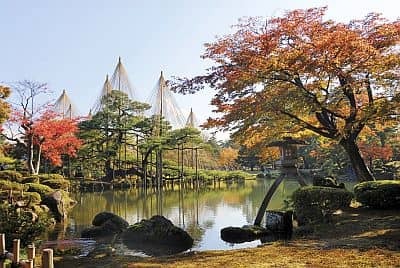 In Kanazawa, a city of Japan, located on the west side of Honshu Island, the climate is humid semi-continental, with cold, damp winters and hot, moist summers; there is no dry season. 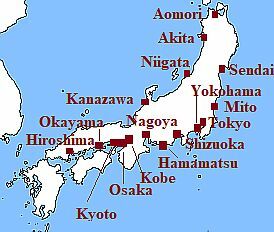 Like the rest of Japan, the city is affected by the monsoon circulation: in winter the northwest cold currents prevail, while in summer they are replaced by hot and humid currents of tropical origin. In winter, cold winds from the Asian continent are loaded with moisture across the sea, and hit the coast directly: in Kanazawa the temperature is slightly above freezing (0 °C or 32 °F), the sky is cloudy, the wind blows, and it rains and snows almost every day. It snows especially in January and February; on average, more than two meters and a half (8 feet) of snow fall per year. The snow is usually wet and therefore very heavy, so the traditional houses have sloping roofs, and the trees in the botanical garden are supported with special rods. Waves of intense cold are rare: usually the temperature does not drop below -5 °C (23 °F), although the cold is fairly constant and the air is humid. While the presence of maritime air in the city makes great snowfalls rare (because even if it snows a lot, the snow tends to melt), in the interior regions, already at low altitude but especially on the slopes of the mountains exposed to the northwest, very heavy snowfalls occur, and meters of snow accumulate: it is no coincidence that this region of Japan is called "snow country", or Yukiguni (and in the mountains there are several ski lifts). In summer, periods of fine weather, hot and humid, alternate with periods of bad weather, with wind and rain. August is the warmest month, both because of the thermal inertia of the sea and because of the lower frequency of periods of bad weather. In Kanazawa, precipitation is definitely abundant: up to 2,400 millimeters (94.5 inches) per year, which make it one of the rainiest cities in Japan (together with some cities on the southern side of the island of Honshu such as Shizuoka and Owase) and one of the extratropical rainiest cities in the world (together with Valdivia, Chile). Precipitation is more frequent in winter, but more intense in summer. The (relatively) driest season is spring; in summer, when the monsoon is somewhat less intense than in southern Japan, in August there is a certain drop in rainfall. Here is the average precipitation. From June to October (but especially from August to early October), Kanazawa can be affected by typhoons, though usually with lower intensity than in southern Japan. The cherry blossoming in Kanazawa occurs around 7/8 April, with a variability of about one week before or after depending on the year, while from late October to mid-November you can admire the autumn leaves in the famous Kenrokuen Garden (which is considered one of the three most important, along with Kairakuen in Mito and Korakuen in Okayama) or around temples. The sun in Kanazawa is rarely seen in winter, when the sky is generally cloudy; in the other seasons, the degree of sunshine is not very good, however, there are two relative maxima, one in spring (April-May) and the other in August, which as we said is among the summer months the one with the best weather. In Kanazawa, the sea becomes warm enough for swimming in August and September, while it is a bit cool in July.